Meadors’ Conservation and Preservation Planning department provides documentation, materials analysis, and treatment services for the preservation of historic buildings and monuments. Meadors has the ability to perform testing and analysis of architectural materials through its in-house architectural conservation laboratory, which is equipped for finishes analysis, mortar analysis, and material characterization. 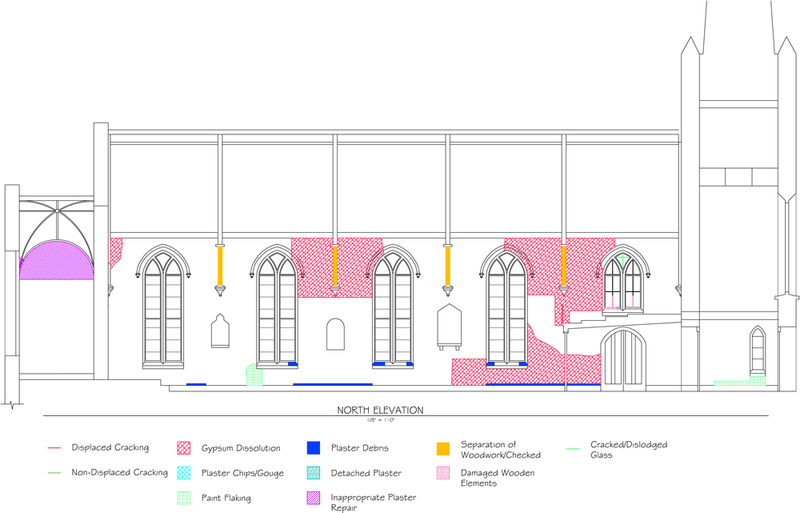 The laboratory’s services are utilized for preservation projects undertaken by architects and contractors, institutions, or individuals requiring architectural conservation expertise. Retaining the integrity of historic buildings and selecting appropriate repair materials is a priority when performing preservation work. 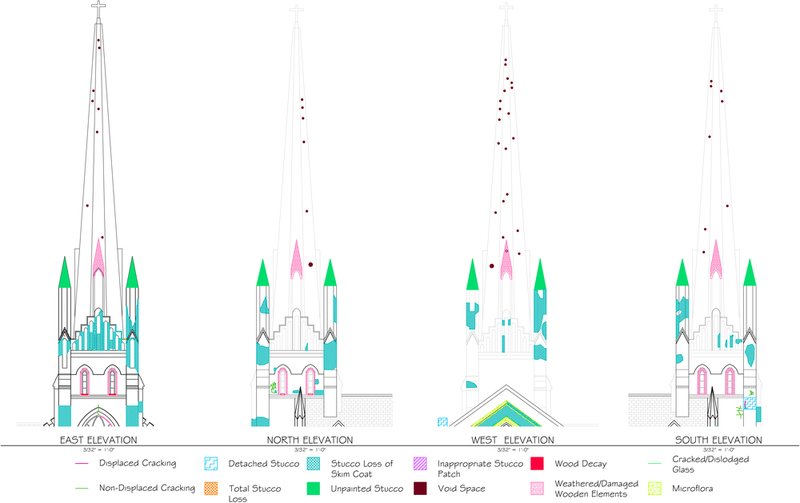 Scientific analysis of architectural finishes, masonry, wood, metals, mortar, and plaster is often necessary to understand the composition and properties of these materials in order to determine how they can be successfully treated or replicated. It is the mission of Meadors’ conservation department to provide these conservation services to the preservation community following the highest standards of building conservation, while adhering to the American Institute for Conservation’s Code of Ethics. Meadors Conservation and Preservation Planning is currently engaged with the Town of Bluffton to develop a preservation plan update, perform a structural assessment, and design the restoration of the ca. 1870 Garvin House. This structure is a rare surviving example of a home constructed and occupied by a freedman in the South Carolina Lowcountry. The Garvin Family lived in the home until the 1970s. 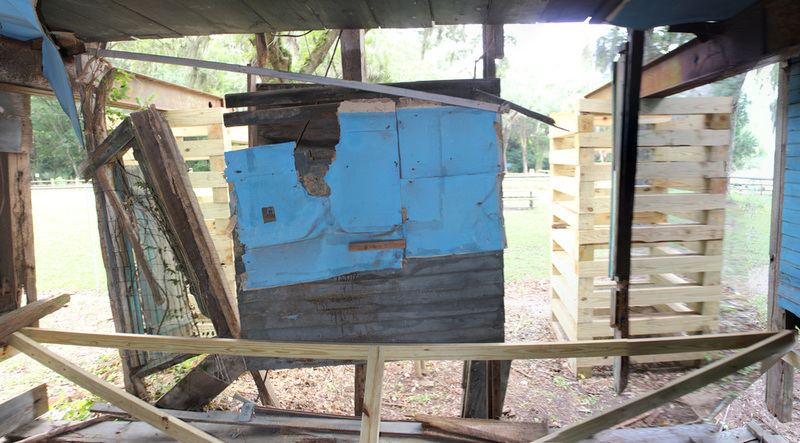 The house is currently in a state of continuing decay and has been structurally stabilized twice in the last 5 years. Meadors is focused on preserving the existing elements of this historic house and planning for a sensitive rehabilitation of the house so that it can serve the community. 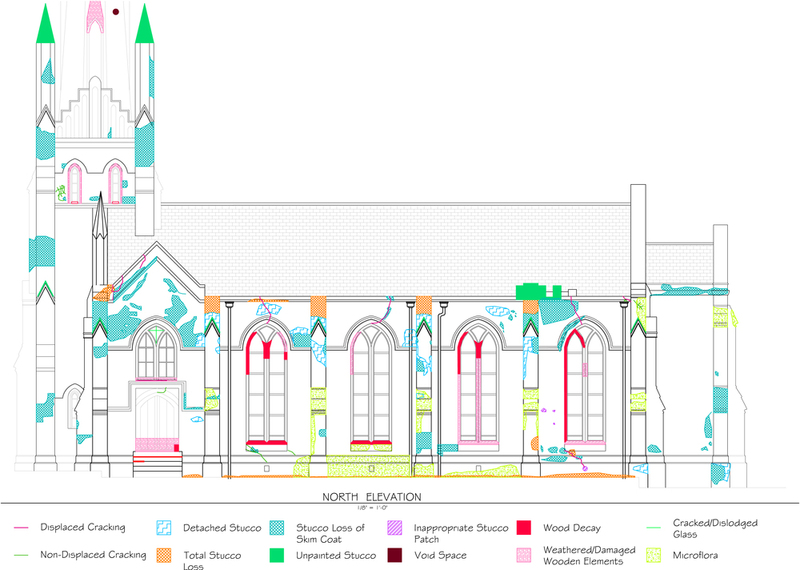 During the course of this work, Meadors has worked extensively with the community of Bluffton, conducting numerous stakeholder meetings to seek input on the structure and to develop a cumulative narrative of the building’s history from past research and local memory. Following the identification of several potential uses, Meadors is now developing construction drawings and specifications that focus on maximizing the retention of historic character defining elements and minimize the further loss of historic fabric. 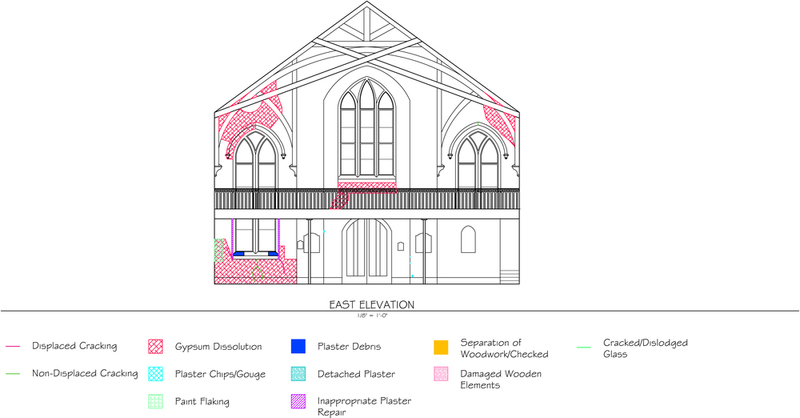 Meadors Conservation recently completed a structural assessment of the building envelope and interior of Trinity Episcopal Church in Abbeville, SC. Crack monitors were installed throughout the building to monitor existing cracks in the masonry walls and trusses. As part of the project, the historic bedding mortar and stucco were analyzed by our conservation laboratory to determine the original components and specify historically appropriate replication mixes. The stucco was found to be a natural cement and the original bedding mortar a mix of lime, brick dust, and an unwashed finely graded aggregate. 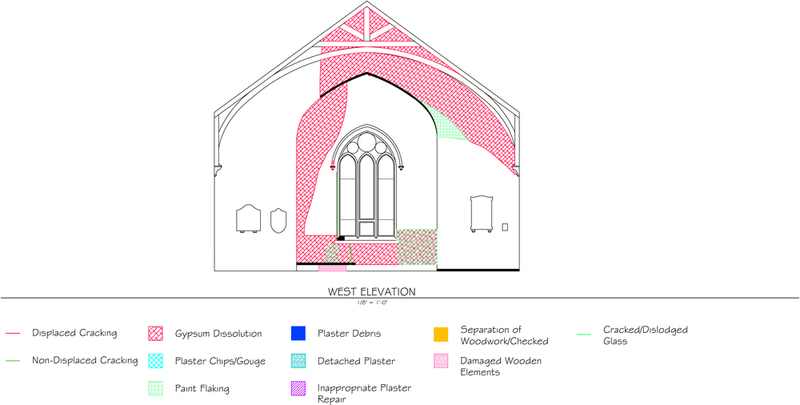 Based on the conditions identified during field work Meadors developed a prioritized list of repairs and corresponding budget numbers for the church to plan for future restoration campaigns. Recent advances in the field of architectural conservation have led to a greater reliance on non-destructive testing to evaluate fragile historic material. Meadors recently conducted an assessment focused on investigating the use of non-destructive infrared thermography to evaluate the interior plaster of the Aiken-Rhett House Museum (c.1820) in comparison with traditional sounding methods. The Aiken-Rhett House Museum is considered one of the most intact urban townhouse complexes in the United States. The interior plaster at the Aiken-Rhett House museum is a major visible component of the structure and has been left largely untouched over the last two centuries. 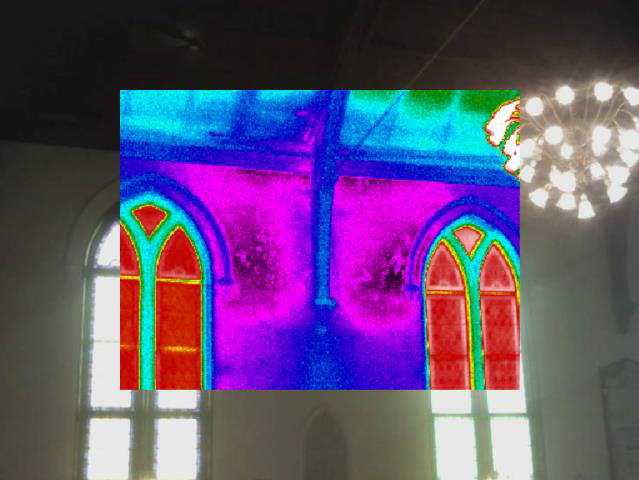 Architectural conservators evaluated the plaster surfaces in two second floor chambers using traditional methods of sounding while additional team members independently assessed the historic plaster in the same rooms using active and passive infrared thermography. The results of the blind study revealed that both assessment methods identified the same areas of deterioration, with a few exceptions. Active infrared thermography was able to quickly diagnose areas of deterioration and cracking hidden behind surface finishes. Betty received her architecture degree from Clemson University, Master of Architecture and Master of Science in Historic Preservation from University of Pennsylvania. Betty is a licensed architect and an architectural conservator with experience working on historic structures both in the United States and abroad. As a preservationist, architect, and project manager, Betty's expertise includes all phases of the restoration process from preservation planning to the Board of Architectural Review approval process. As a conservator, she provides materials analysis services as well as develops treatment and preservation plans for historic structures. She specializes in the scientific analysis of historic finishes. Fillmore received his Master of History from the University of South Carolina. He has over 30 years of experience in the construction industry and trades specializing in historic restoration, conditions assessments, forensic inspection, and developing preservation plans in collaboration with other design professionals. Fillmore taught Advanced Placement US History for seven years, and continues to stay involved in the field of education, guest lecturing for college level History and Preservation programs throughout the state of South Carolina. Kalen received his geology and historic preservation degrees from the College of Charleston and his Master of Science in Historic Preservation from the University of Pennsylvania. Kalen brings a well-rounded approach to conservation projects because of his strong foundation in archaeology, geology, preservation theory, and laboratory training. As a conservator and preservationist, his experience included mortar analysis, historic paint investigation, and the preparation of conditions assessments. He specializes in the conservation of architectural stone, and has worked on multiple nationally registered sites.